Twit pitch: An animal nature is easy, she is trying to understand what it is to be human. Appearance: Naali is about 5’4” and weighs about 120#. She has reddish-brown hair which turns thicker and white in the winter time. Her complexion is pale, like that of a light cream. Her eyes are brown. She tends to wear simple clothing. She does not wear makeup or jewelry. She does not like things around her neck. If you could get Naali to talk about it you would learn that she sees herself as an explorer. The world is a place to be explored and investigated. She also sees herself as a survivor. She knows she can survive anyplace. She has learned this by living in Endrykas. Food can be found if you look for it. You can find shelter too with a little effort. She has the attitude that things are. Some things are good, some things are bad, and some things just are what they are meant to be. Naali thinks she is average looking. She is not really worried about what others think about her. People would notice that Naali is an attractive young lady that has a free spirit. She is curious about things. She is touching, smelling, tasting things trying to categorize them in her mind. She is a social creature with a gentle temperament. She is a bit naïve. Naali is very fit. She spends a lot of time walking, running, digging and foraging. She likes to be moving and is not great at sitting still for periods of time. Like the picture, Naali likes to wear dresses and cloaks. She prefers being barefooted to wearing boots, but she will wear boots when she is traveling a distance (or if strongly encouraged). She does not like collars as they limit her freedom. In both her human form and fox form hair changes color with the seasons, Reddish-brown in the summer to white in the winter. Naali’s other noticeable animal characteristics are sharp teeth and eyes that are good at seeing at night. 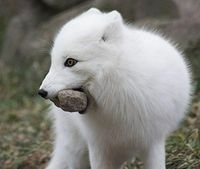 Naali’s animal form is that of an Arctic Fox. In this form she claws that let her climb trees or buildings. She can see the earth’s magnetic field as a “ring of shadow” on its eyes that darkens as it heads towards the magnetic north (New Scientist). She can handle cold better than most animals on earth. 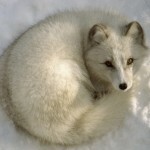 Arctic foxes do not even get cold until –70 degrees Celsius. She also has fur on the bottom of her feet to let her walk on ice without slipping. Her white coat also camouflages it against predators. As the seasons change, the coat changes too, turning brown or gray so the fox can blend in with the rocks and dirt of the tundra. learned somethingAll things that I did not know! In her animal form, she is small, she is about thirty inches in length from the tip of her nose to the tip of her tail. About of third of this length is her tail. She stands about one foot tall and weighs about six pounds. Now being a fox in the grasslands was a wonderful adventure. Food was always plentiful if you weren’t too picky. There were lots of things to explore. But the hawks and eagles make me a bit nervous. There are a few things that Naali is afraid of: large birds - like eagles and dragons, the sea, cages, and slavers. At this point - Food obsessed. Not really combative - Why fight when you can run away? Wants to learn - If it sounds interesting, she will want to learn it. Unlike the fox - loyal to her friends. Heroic - she will jump in to save someone. Naali is a vixen that is out to discover the world, find her place in it, and to find her bondmate. She has dreamed about becoming a bard, a merchant, or a healer. Naali is a bit naive and curious about things; this is the nature of foxes. Like most foxes, she is opportunistic in what she does. She will scavenge food and little things that she thinks are useful or interesting. A chicken or eggs have gone missing if no one is nearby. She only takes enough to survive and not more. She is not being malicious. Right now, she has the basic skills of a seamstress – sewing and embroidery. She learned these skills from her mother. Learned some basic herbal remedies from her grandmother who was a midwife. Naali is fiercely loyal to her friends, but also needs some alone time to reenergize. Naali was born in the traveling city of Endrykas out in the grasslands. Her birth was nothing special, she seemed healthy, but on the small side. But that is not unusual for children born on the plains. It surprised my parents that I was born as a Kelvic. It had been many generations since a Kelvic was born in my family. I was an oddity in the grasslands, a white pup in a sea of greens and browns. One day at the start of spring of 517, Naali was captured by some barbarian slavers. She had stolen their wild game dinner from their campfire. She managed to give them a good run, but the slavers had horses and caught her. A leather collar on Naali’s neck and she was trapped in her fox form. They had planned on selling me to a fur trader when they took the other slaves to be sold. It was three days later a party from Riverfall came across the caravan of slaves and goods, they managed to kill most of the slave traders and brought us back to the city to be freed. At this point, Naali was still in a cage. After a couple days of being treated like a pet, one of the men cut my collar off. They weren’t expecting a woman appear before them in a natural state of dress. With a little persuasion, she managed to get her things and got dressed. Naali was placed in Nia’s boarding house. Nia had a way with women that had been through traumas. She helped Naali come to terms with what had happened. Naali was offered the chance to learn and become part of the city. A message would be sent to her family to let them know that Naali was alright. So here Naali is in Riverfall. Statuette of Ionu - This statuette can appear as almost anyone or anything. It can look female, male or other. When animated, it speaks in any tone of voice, of any gender, of any race. It never holds the same form for very long. It is rather fond of telling jokes and always points out comical aspects of that which it observes. Gnosis: 1 mark Ionu. Skills: Impersonation: 10, Disguise: 10, Persuasion: 10. Lore: Ionu, Tricks and trickery. Magical Ability: Create a mundane, harmless trick or trap 3 times per day that lasts until triggered or until the day is up. Housing: Small, and only a few have windows since the house is built into the cliffside. Those that don't have windows are well-lit. Every room is sparingly decorated with a bed, a desk, a chair, a small closet, and a dresser. Occupants are welcome to decorate as they see fit as long as they aren't destructive. Naali would prefer a room that was darker and had an earthy smell. Sail palm 12 SM 1 GM 2 SM	 [The port of Riverfall] Stitching. Awe 1 GM 2 GM 2 SM [The port of Riverfall] Stitching. 4 Heavy Needles	 2 GM	 4 GM 2 SM	 [The port of Riverfall] Stitching. Pliers	 8 SM	 5 GM	 [The port of Riverfall] Stitching. Sail Yarn	 2 GM	 7 GM	 [The port of Riverfall] Stitching. Wax	 2 GM	 9 GM	 [The port of Riverfall] Stitching. Fabric	 ? 2 GM 6 SM	 [The port of Riverfall] Stitching. 2 Raime Dresses [14 sm] – One brown and one a rose red. Well she thinks they are brown and rose red. 14 SM	 10 GM 4 SM	 [The port of Riverfall] Stitching. Leather boots	 6 SM	 11 GM	 [The port of Riverfall] Stitching. Leather Sash	 2SM	 11 GM 2 SM	 [The port of Riverfall] Stitching. Leather bag	 2 GM	 11 GM 4 SM	 [The port of Riverfall] Stitching. Total	 14 GM	 [The port of Riverfall] Stitching. [The port of Riverfall] Stitching. Last edited by Naali on July 22nd, 2018, 4:27 pm, edited 6 times in total.